There are many ways in which salt fish is prepared in the Caribbean but the most popular way is fried. We say fried but what we really mean is sautéed with thyme, lots of onions, tomatoes, and hot pepper. 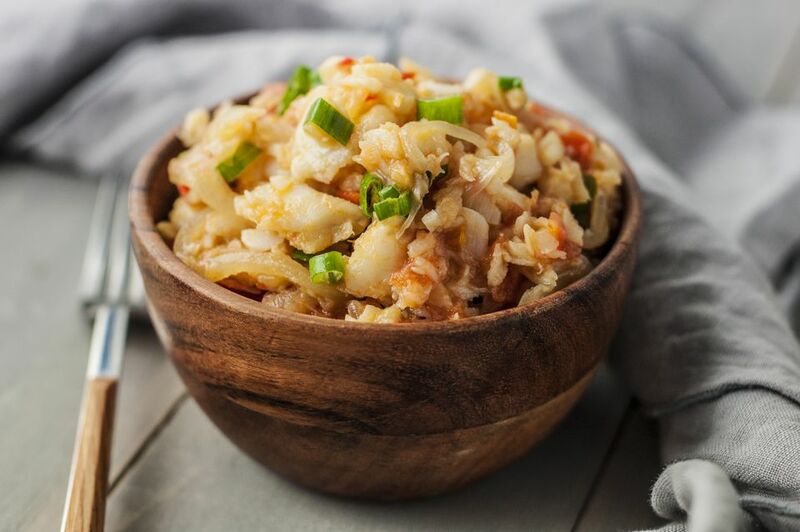 When cooked this way, the salt fish can be eaten with rice, roti, or ground provisions. It is most popularly eaten with bakes (a fried dough). Add oil to a medium skillet and heat over medium heat. Add thyme and cook for one minute. Add garlic, tomatoes, hot pepper, and salt to taste and sauté for one to two minutes. Add shredded salt fish, tossing to mix, and reduce heat to low and let cook for five to seven minutes, tossing every two to three minutes. Fold in green onions one minute before the dish is finished. Remove from heat and serve hot or at room temperature.